This important toy soldier book is written for Marx collectors who want to straighten out the facts about the myriad of Marx Battle of the Blue & Gray playsets with their hundreds of pieces, for sellers who need to know precisely what goes in each set, or if you just want to relive the excitement of owning a Marx Civil War set. It is a book of broad toy soldier appeal. Every Playset - For the very first time, all in one place! 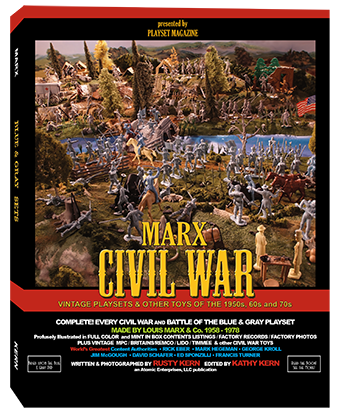 Marx Civil War features fresh, ALL-NEW INFORMATION, photos and contents lists and details on Marx Civil War playsets from throughout the company’s timeline 1955 – 1978, starting fresh from the Famous Americans through the 1960’s to Heritage and Storage Box sets. It’s all here in clear, authoritative detail. 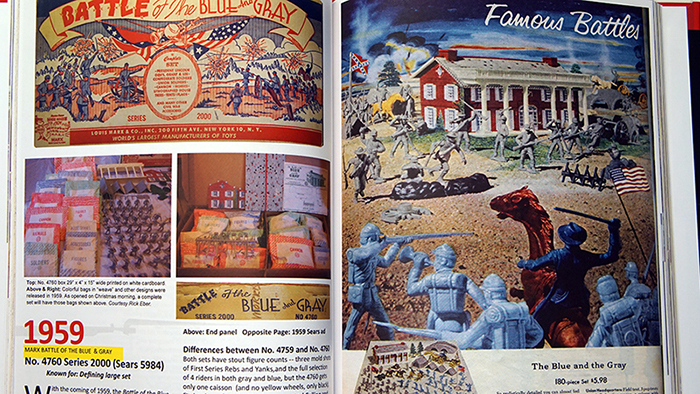 This is a very complete, authoritative approach with easily extracted information for those who enjoy vintage Civil War toys and want more than just the facts. Discusses how sets are alike and how they are different. Written by Rusty Kern with commentary by the World’s greatest Content Authorities. Bonus! Easily accessed, information-friendly layout is clearly arranged. An economical soft cover, and hard cover versions. Each contains the very same dynamically presented information.